Protesters outside NBC's studios weren't the only ones who threw shade at Donald Trump for his Saturday Night Live hosting gig. 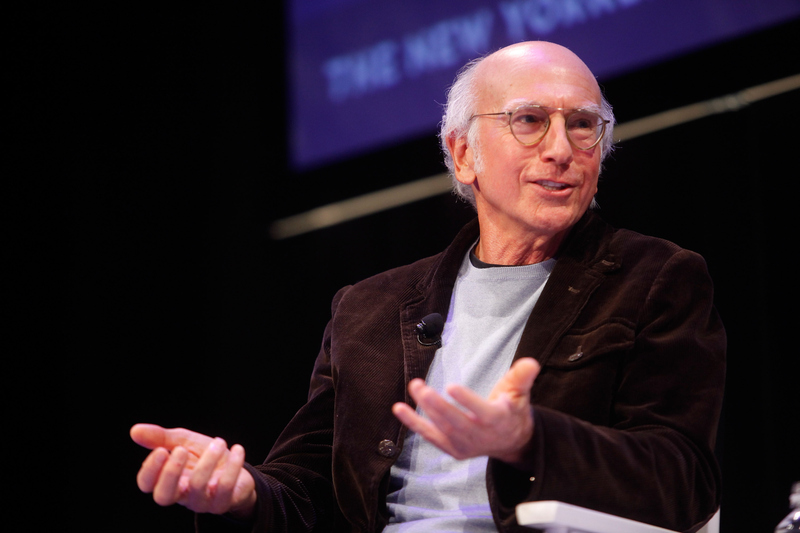 In a surprise appearance, Larry David reprised his role as Vermont Sen. Bernie Sanders — and he ended up stealing the show in more ways than one. In fact, David's face at the end of SNL pretty much said what we were all feeling about the lackluster show. Initially, David helped open the show with an entertaining and creatively accurate spoof of Friday night's Democratic forum, hosted by MSNBC's Rachel Maddow in South Carolina. In his now-usual role (or can we at least hope it's his usual role?) as Sanders, David joked about infrastructure, Sanders' age, and the sorts of donations he's looking for on the campaign trail. (I'll give you a hint: It's not millions of dollars… or even quarters.) David also heckled Trump during his opening monologue, yelling from backstage, "Trump's a racist!" This incident seemed to catch Trump slightly off-guard, but it certainly shouldn't have been unexpected, as crowds of people had gathered outside SNL's studios throughout the day to protest Trump's appearance on the show. But by the end of it all, David seemed to have no problem showing exactly how he felt standing with Trump during the credits roll. See for yourself, screen capture courtesy of GQ. Trump stands between David and his daughter Ivanka, although their facial expressions could not be more different. Whereas Ivanka has an enthusiastic look of approval for her father, David stands with his hands in his pockets, a defeated expression on his face. In reality, it's probably not that he feels defeated, but he definitely looks like he was ready to get off that stage and away from Trump. It's probably safe to say that David wasn't really paying attention to what The Donald had to say in his final moments on the SNL stage. We're used to Trump throwing shade at others when he's in the spotlight — namely women he doesn't like, his fellow candidates, or groups of voters — but seeing someone as recognizable as David with an expression of complete dissatisfaction while listening to Trump is a refreshing turn of events. It seems not even Sia's lovely covered face could bring comfort to David in the close. Let's just enjoy the fact that Trump probably won't be back on SNL for some time — but you can bet Larry David as Bernie Sanders will be.